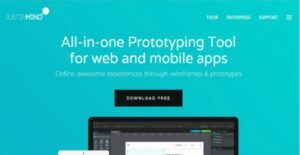 JUSTINMIND is an all-in-one wireframe and prototyping platform for web and mobile apps that allows users without technical expertise to get things done. It allows previewing ideas on all type of screens, including web browsers, Android and iOS. The drag-and-drop interface makes it easier for beginners to get started using templates and customize them according to their own requirements. The UI Kits come preloaded with the platform and allow designing beautiful interfaces with clickable regions and functional UI prototypes. The platform works great for users who don’t have technical expertise and coding experience usually needed for prototyping apps and working with advanced mobile and web interactions. Transitions, gestures, animations, effects and more are also covered, while data tables, smart forms and dynamic behavior ensure realistic simulation of the ideas. From mockup designs to fully-functional UI prototypes, JUSTINMIND provides all the tools users need to prototype feature-rich web and mobile apps, web products, sites, enterprise-grade software and more. The UI kits make it easier to prototype apps and help them get started right away. Wireframes can be effortlessly defined and shared with team members for feedback. The entire wireframe experience can be published in a single click for which users and customers can provide reviews and feedback. Being a drag-and-drop platform, JUSTINMIND allows creating codeless wireframe design that includes interactive wireframes, animations, interactions as well as data. This makes the platform a solid tool for users who want to visualize their design ideas before actually moving on to coding. Faster prototyping and communication allows users to prototype their ideas in less time and mockup their apps live on multiple platforms. Reviewer management features provide complete control over who can access or review a prototype, while the review system can also be integrated with popular user testing tools. The data grids and smart forms can be instantly tested and can also be enhanced with conditional navigation, advanced behaviors and a more personalized experience. The AIO package includes Android and iOS UI elements and libraries, web UI elements and custom libraries. It integrates with Google Font and other design tools such as Photoshop and Sketch, while the images update automatically when they are modified. If you are interested in JUSTINMIND it could also be sensible to examine other subcategories of Best Application Development Software listed in our database of B2B software reviews. It is essential to note that hardly any service in the Application Development Software category will be a perfect solution that can match all the goals of different business types, sizes and industries. It may be a good idea to read a few JUSTINMIND reviews first as some solutions can dominate only in a very narrow group of applications or be created with a very specific type of industry in mind. Others may function with an idea of being simple and intuitive and therefore lack complicated functions welcomed by more experienced users. You can also come across software that focus on a large group of customers and offer a complex feature base, however this usually comes at a higher price of such a software. Be certain that you're aware of your requirements so that you buy a service that has specifically the functionalities you look for. How Much Does JUSTINMIND Cost? We realize that when you make a decision to buy Application Development Software it’s important not only to see how experts evaluate it in their reviews, but also to find out if the real people and companies that buy it are actually satisfied with the product. That’s why we’ve created our behavior-based Customer Satisfaction Algorithm™ that gathers customer reviews, comments and JUSTINMIND reviews across a wide range of social media sites. The data is then presented in an easy to digest form showing how many people had positive and negative experience with JUSTINMIND. With that information at hand you should be equipped to make an informed buying decision that you won’t regret. What are JUSTINMIND pricing details? What integrations are available for JUSTINMIND?